For over 100 years, Milwaukee had two newspapers; the Sentinel (founded in 1837), and the Journal (founded 1882). In 1962, the Journal purchased the Sentinel, publishing the Sentinel in the morning and the Journal in the evening. 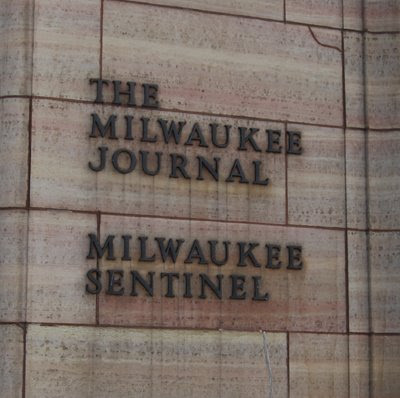 In 1995, the papers were merged, and the Journal Sentinel became Milwaukee's major daily newspaper. Personally, I miss reading the Green Sheet every day. Personal note: according to Blogger, this is post #100. In some ways, it came a lot quicker than I expected. In others, it was a very long time coming. In 1997 I moved back here and went to the store to buy the Journal with the Green Sheet. The kid at the counter never heard of it and thought I was crazy.